Tonight I got out the cardmaking things and ended up knee deep in pretty things as I experimented with colours and patterns for a birthday card for my baby. It was one of those projects where you think ‘all I’ll need is the Cricut machine, card and adhesives.’ Several trips to the craft cupboard later…… Continue reading Cardmaking Heaven! It’s finished! I had an unexpected day off work as my daughter was poorly, so whilst she slept I crocheted the border (and washed all of the bedding J got through last night!) The border was just treble crochet around the posts-1 stitch on a dc row and 2 on a treble row. I kept…… Continue reading A blanket at last! Tonight the blanket has reached a milestone-the main body is finished. All that is left is the border, I can’t decide what to do so I am browsing. The Attic24 blog is proving rather helpful with this though! It is a huge relief; as much as I love the blanket I was getting a little…… Continue reading The end is in sight! Today we spent 4 hours in the freezing cold at the allotment. My main jobs were weeding, crowd control (we haven’t fenced around it yet and the children wanted to explore) and planting raspberry canes. I managed 1 out of 3 so I’m going to call it a win as the raspberries are in fairly…… Continue reading Shed update-it has windows! Whilst tidying and sorting I found these. I made them almost a year ago, but it feels like yesterday. 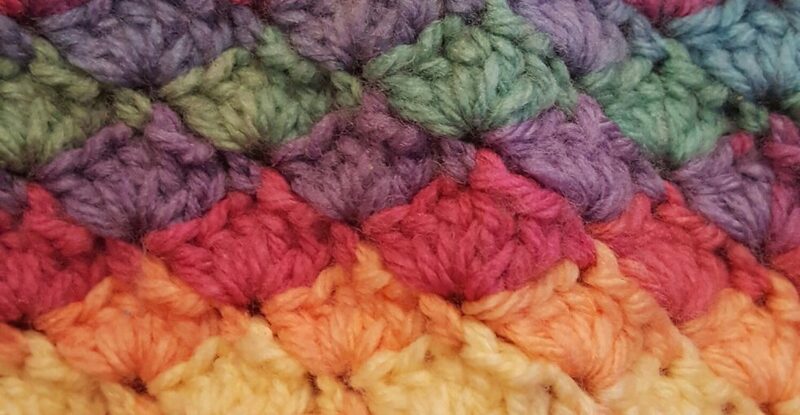 They were one of my first crochet garments and taught me a few important lessons about gauge and actually reading patterns. I must have made the sole of the first boot around 5 times before it…… Continue reading Bootiful!